Discover industry-leading insights into employee engagement trends, and find out what it takes to lead a high-performing team. 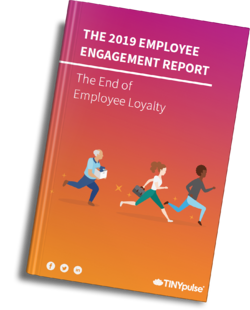 We created this report to empower you to unlock the passion, drive and loyalty of your employees. Whether you’re a CEO, HR manager or an entry-level culture champion, our goal is to deliver data-driven strategies that get results. How many employees would leave their organization for a 10% pay raise...and what managers can do to buck this trend. How organizations can combat the startling lack of self awareness in management regarding communication and transparency. The #1 factor that predicts employee performance. Fill out the form to start building the ultimate employee engagement strategy for your organization.